The AFC East showdown between the Miami Dolphins and the Buffalo Bills will close down the ruined season for both these teams, as they will spend January in front of their TVs once again. The Dolphins won the first head-to-head duel of the season at home, beating the Bills 21-17 as 3.5-point favorites, while they opened as3.5-point dogs on this one with the total at 39.5 points and the Bills at -190 money line odds. The Miami Dolphins (7-8; 8-7 ATS) were close this year, but certainly not enough to have playoff hopes ahead of Week 17, so they will miss the post-season for the second straight year and ninth time over the previous ten seasons. They are coming off another upsetting defeat, this time to the Jacksonville Jaguars 17-7 at home that was their only second loss at Hard Rock Stadium this year. 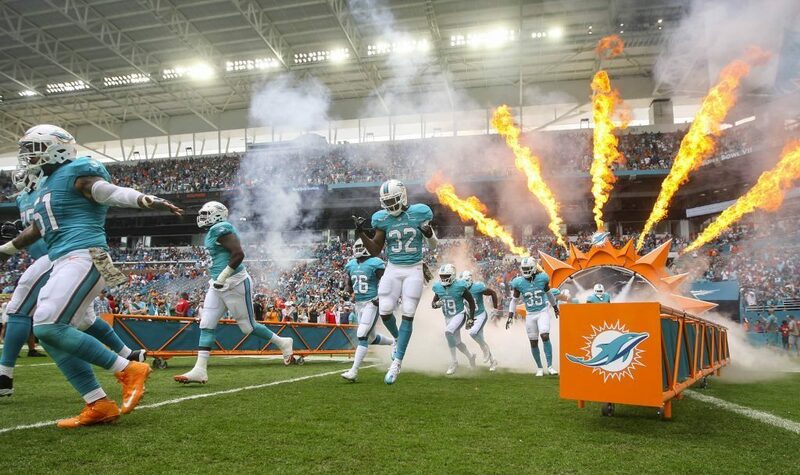 The Dolphins are just 1-6 straight up and 2-5 ATS in seven road games this season, and are 3-9 straight up and ATS in the previous 12 road games against the AFC East. Miami is averaging 20.1 points (25th in the league) on miserable 294.2 total yards per game (30th), allowing 26.1 points in a return (26th) on 391.7 total yards per contest (30th). Ryan Tannehill is having another disappointing season, throwing for 1832 yards, 17 touchdowns, and seven interceptions in 10 appearances, completing 65.0% of his passes. There are a lot of rumors these days that Tannehill won’t return to Miami next season. The veteran RB Frank Gore is leading the backfield with 156 carries for 722 yards without a score, but he has a TD on 12 receptions for 124 yards. Kenyan Drake has 109 totes for 492 yards and four touchdowns, also adding 48 catches for 425 yards and five touchdowns. Kenny Stills is leading the receiving corps with 34 catches for 526 yards and six touchdowns. The Buffalo Bills (5-10; 6-9 ATS) won’t replicate their success from the last season just because their offense is playing awkwardly all season long. Last week, in a 24-12 defeat at the Patriots, the Bills racked up just 289 yards, recording 14 1st downs and converting only two of their 12 3rd downs. It was their sixth defeat on the road this season along with a couple of wins, while the Bills are 3-4 straight up and 2-5 ATS in their seven games at New Era Field this season. While the Bills’ defense is allowing 23.8 points (18th in the league) on 298.7 total yards per game (2nd), their offense is averaging just 15.1 points (31st) on 293.1 total yards per contest (also 31st). In his rookie season, the QB Josh Allen is a go-to-guy in Buffalo’s backfield. He has tossed for 1850 yards, seven touchdowns, and 11 interceptions in 11 appearances, completing just 51.7% of his passes, but he’s added 80 carries for 536 yards and six touchdowns. The veteran RB LeSean McCoy has 151 carries for just 488 yards and a couple of touchdowns, while Chris Ivory added 101 carries for 340 yards and a TD. Zay Jones is leading the receiving corps with 50 catches for 559 yards and five touchdowns. On the other side, the linebacker Matt Milano has 13.5 tackles for loss, Lorenzo Alexander has 6.5 sacks and 13 tackles for loss, while DE Jerry Hughes added 6 sacks and 15.5 tackles for loss, also forcing three fumbles. With nothing but proud at stake, this is a tricky matchup to nail the winner, as it could really go either way. The Bills are playing at home, so they should be at least motivated to cheer up their fans. Hereof, I will take them to cover even though this could be a close game within three points. However, the betting trends are also suggesting Buffalo, and the home team is 7-3 ATS in the last 10 meetings between Buffalo and Miami. The chalk has been set pretty low, but when I take a look at those numbers in attacking columns, I cannot wager on the over. These two offenses are so poor that 40 points should be inaccessible in two games. The tricky side of this bet is that both teams can play a relaxed manner, but their defenses should dominate this game.